As the saying goes in Brazilian jiu jitsu, ‘Tap or snap.’ While Antonio Rodrigo Nogueira was busy contemplating whether to submit to a kimura at UFC 140, Frank Mir continued to crank on Nogueira’s right arm until he was told to stop. Unfortunately for Big Nog, by the time he decided to tap, it was too late and fans were forced to witness his arm take an unnatural and disgusting turn. At the post-fight press conference, Mir said he had a feeling Nogueira wasn’t going to cry uncle and that he might have to break his arm in order to leave the Air Canada Centre in Toronto with a win. Although it appeared as though Nogueira had victory within his grasp, he decided to go for a guillotine choke instead of continuing to pound on his dazed opponent’s dome. Fast-forward a few seconds and Mir rallied to post a highlight reel submission at the 3:38 mark in the 1stRound. Nogueira remained on the canvas for several minutes after the fight was called. Physicians placed the 35-year-old’s arm in a sling before he made his way back to the locker room. 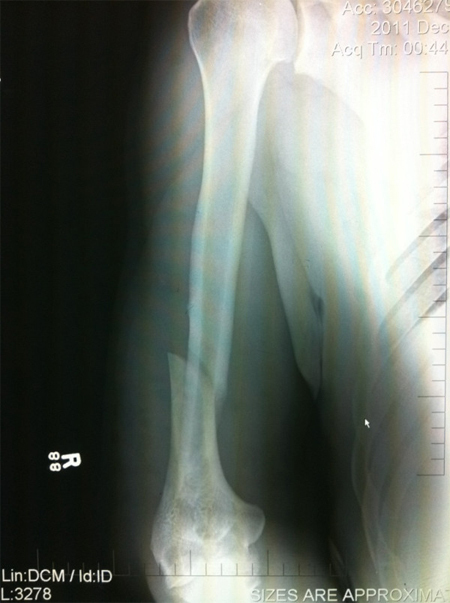 While UFC president Dana White said he didn’t know the state of Nogueira’s arm during the presser, the company tweeted the above X-ray to confirm the veteran’s fracture.